From a sustainability stand point, bike lane infrastructure in any city would seem like an obvious positive. Bikes are an environmentally sound way to get around, they decrease the number of cars on the road and the offer health benefits to riders. 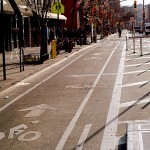 Bike lanes make cycling a safe and viable transportation alternative for city residents. Win, win right? Wrong.